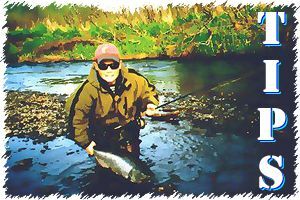 When fishing a high pressure river or stream, like the upper Kenai River, someone in the group should focus on using patterns with a reduced profile and more subdued pattern. In other words, downsize the pattern to minimal proportions and use that while others fish the larger versions. Many times when a fishery comes under a lot of angler pressure, day after day all season long, the fish tend to become shy of the traditional sizes of successful patterns. Subdued selections and "less is more" philosophy may reap signficant rewards. Be sure to have minimal sizes in your flybox if the fishing is tough.